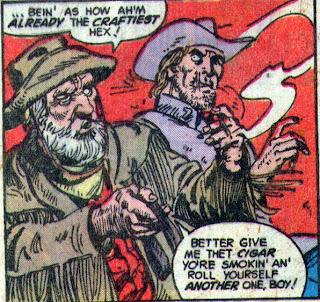 Matching Dragoons: Jonah Hex #20 "Phantom Stage to Willow Bend!" 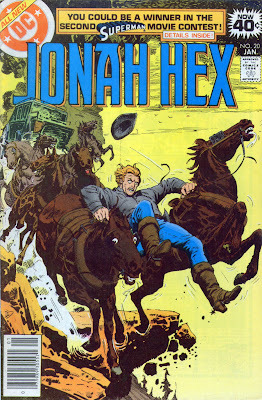 Jonah Hex #20 "Phantom Stage to Willow Bend!" "Phantom Stage to Willow Bend!" Our tale begins with Jonah Hex upon his horse on a hill overlooking the Willow Bend stagecoach being robbed. Jonah really doesn't have an interest in the robbery, but he figured that somehow, some of the robbers just may have a bounty on their heads. He dismounts, pulls his rifle and take careful aim. Down below the robbers are badmouthing the old driver when suddenly one of them is shot off of his horse. Just then another one falls, and then a third. The robbers are spooked and return some fire but a fourth falls and as they ride away, a fifth robber is shot from his saddle. Jonah rides down to collect his bounties and the old driver is thanking him for the help. Jonah dismissed the gratitude, saying he was in it for the money. The driver said that he knew that Jonah wasn't doing it out of the kindness of his heart, Hexes don't do anything unless there is a profit to be made. Jonah's jaw drops open as he suddenly recognizes his father is the driver! They load up the bodies and head on for town. During the ride back, Woodson keeps jabbering nonstop, saying that he has heard tales of Jonah. He knew that Jonah would become the fastest Hex, but he would always be the craftiest Hex. Woodson steals Jonah's cigar and then asks what happened to Jonah's face. Jonah decides to ignore the old man, pulls his hat over his eyes. 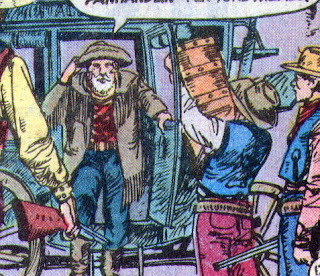 We then have a flashback (almost 25 years) to July, 1851 (putting this story in 1875 or early 1876) when Woodson decides to head to California to the gold rush. Woodson and Jonah with a bunch of Apaches. Woodson sells the Apaches a whole shipment of moonshine in exchange for a pile of pelts. The Apaches then bring out another load of pelts and tell Woodson that these are for Jonah, as they had agreed earlier. Woodson takes the pelts in order to get a grubstake up for the gold rush and leaves Jonah with the Apaches. Back in the present, the stage arrives at Willow Bend and Woodson introduces Jonah to Mr. Barton, owner of the stage. Barton tells Jonah that there is a bounty on each of the outlaws and then offers Jonah a job guarding tomorrow's shipment to Willow Bend. Barton explains that his stage has been hit repeatedly and tomorrow they will be sending a quarter of a million dollars in Double Eagles. Let's see, a Double Eagle is a $20 gold piece that contains about .9675 ounces of gold. 12,500 coins are required to equal $250,000. 12,500 X .9675 oz = 12093.75 oz / 16 oz = 755.86 pounds. And in case you are wondering, the face value of the shipment today would be 4.3 million. But the face value of the gold would be just over 8 million. But these are Double Eagles and if they were minted in Carson City, then they would be worth about $1700 each (the San Francisco coins are worth far less) so the total worth of the stash would be $21.25 million. Nice pickings, IF ya can move all 755 pounds of it. But I digress. Jonah takes the job but requests some carpentry tools, extra long reins and extra clothes and he tells his dad that they are pulling out at 4 AM. The next morning the stage approaches a narrow gulch and high up in the rocks overlooking it are five armed men. They carefully take aim and are able to shoot the stage driver dead center but to their surprise the stage keeps going. Inside the stage are Jonah & Woodson. Woodson is congratulating Jonah on his good idea of putting dummys up on top of the stage and then controlling the reins from inside the stage itself. Woodson says that he always knew that Jonah was the fastest Hex but HE is the craftiest and then he knocks Jonah out with a whiskey bottle. Woodson stops the stage and the robbers come down form the hills. While the strongest cowboy in the whole world unloads the stage, one of the men asks Woodson what they should do with Jonah. Woodson replies, "Yuh mean muh boy? Muh flesh an blood favorite son? We ain't got no choice but tuh kill im. After all, he's a Hex, ain't he? If'n we don't kill im, he'll just dog us down and kill us all." He has the men douse the stage in kerosene and light it on fire. A) The stage is on fire. B) The door is locked. D) if stage doors locked, they would lock from the inside. So he decides the only way out is to kick a hole in the roof and crawl out the top. Jonah sees that the stage is heading for a cliff, he jumps down on top of the horses, trying to stop them and at the last minute jumps from the horses as the whole shooting match rockets over the edge of the cliff. 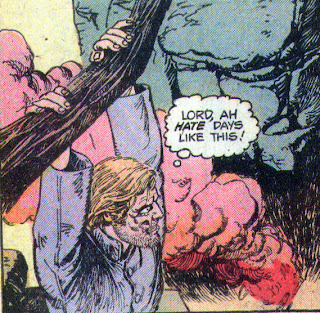 Jonah manages to snag onto a tree limb and save his neck. Much later we find Jonah buying a horse from a farmer and he takes off after the robbers & his pappy. That night the robbers are camped and have a fire going when Jonah steps out of the shadows with both pistols drawn. One of them draws and Jonah sends three of them packing toot sweet. Jonah confronts his dad, demanding to know where the other two robbers are. One of them calls Jonah's name and Jonah spins, shooting him dead and getting nicked in the right shoulder. The last robber steps between Jonah & Woodson and as he is about to gun down Jonah, Woodson throws scalding coffee into his face and then shoots him dead. Jonah thanks his dad for the save and Woodson replies that he has been thinking about what he had done and was feeling some remorse. Woodson suddenly grabs his chest and topples over. Jonah picks him up, loads him on a horse and takes him to a doctor. At the doc's, the sawbones opens the door and says, "Forget it mister! No medicine known to man is ever going to cure that face of yours." Jonah throws open the door and hauls his dad inside. The doc tells Jonah that the doc needs to examine Woodson alone. Several minutes later the doctor comes out and tells Jonah that Woodson has had a heart attack. Jonah goes into the room and sees Woodson lying on a table, barely gasping for breath. Woodson asks Jonah for one last favor, could he please have a fancy funeral. Jonah agrees and asks where the money is buried. Woodson says that he and the gang hid it in ....... and then he dies. Jonah leaves the doctors and the next day after the funeral the doc asks if Jonah loved his dad. Jonah replies that he hated the old man but he guesses that a man only has one pa and then Jonah rides off. The doctor returns to his office to find Woodson getting dressed. Woodson pays the doc, asking if the funeral for the box of rocks was a good one. The doc says that Woodson's instructions were followed completely and then says that it all seems kind of cruel. Woodson replies that Jonah & he play jokes on one another all the time. Later in a mountian cave we see Woodson digging up something and then riding off, laughing to himself the whole time. Jonah's Injuries: Knocked out with a whiskey bottle and a bullet wound to the right shoulder. Timeline: The opening reference in the flashback would place this in 1875 or 1876. I'm more inclined to say 1875 because Michael Fleisher was a very lazy historian and everything happened in 1875. This story covered 3 days. The body count was pretty high in this one and I liked the relationship between Jonah & his dad. It seemed pretty traumatic to have Jonah meet his dad and then have him dead 3 days later. The title, while dramatic, is very misleading. I guess you could consider the stage to be a phantom since it appeared that no one was driving it. Next Issue: This one is full of whore slappin, double crossin, crowbar swingin, child beatin, Hex drownin, and everything ends with a bang. Oh, and Jonah has a really close shave. My goodness! In comparison to his old goat of a father, Jonah appears to be almost genteel in his ways! Good story. Good good story.